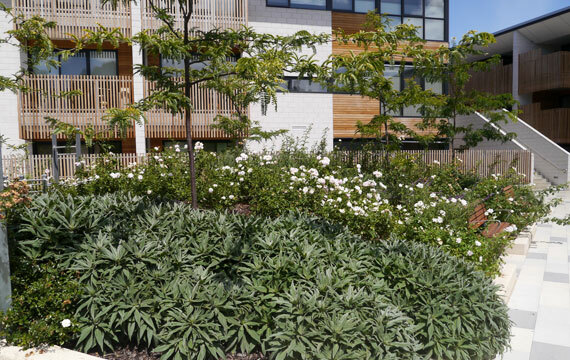 Victoria Grange is an aged care apartment/village development by Australian Unity with Woodhead Architects, with designed streetscapes and landscaped gardens centred on a new resident community centre. Green & Dale Associates provided design of the landscaped gardens and the central focus of the development, the central courtyard garden. Formerly the floor of a quarry, the courtyard was transformed into an ornamental garden, with seating areas, community gathering areas and a practice bowling green. A major design constraint for the design was creating a garden on a rock floor. This was solved using roof top garden design principles, with specialised drainage, irrigation and built up garden beds. 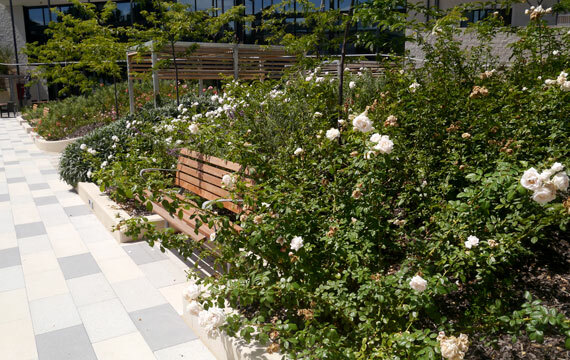 The gardens are specifically designed to improve the health and well-being of the residents through sensory stimulation of flowering gardens, seating arbors, exercise areas, a bowling green and community ‘veggie’ gardens. All these provide residents with meaningful daily activities and an opportunity to socialise.